Fed up with short, punchy news titles such as "Outsourcing is Dead", or "My Delivery Manager Ate my Hamster", designed purely to capture your attention with minimal substance? Instead, let's talk about outsourcing vendors, and what on earth they are going to do when these tasty labor-arbitrage deals start to fizzle-out. As we discussed at length back in November, operational service provision is commoditizing and leveling the playing field. Customers did their planning during the recession, and, now armageddon has (apparently) been averted, it's time to execute on that planning. And part of many customers' planning right now, is to take advantage of moving operational support offshore and driving out some cost. This is bonanza-time for the offshore-specialists that can deliver basic IT and BPO services at competitive prices. Contract-signings that were delayed during the painful recession months are now in full-swing, service vendors are reporting healthy results and even the sourcing advisors have stopped moaning about their lack of deals, and are making money again. However - let's not get too carried away. While the outsourcing market has rebounded, and it's likely to remain strong for most of 2010 (read Part III when I get around to the next piece shortly), these labor-arbitrage deals are not infinite. Once customers have moved out as much of the easy work to service providers as they can, their focus will move to finding that next tranche of productivity, and it's not going to be as simple as documenting standard processes and training an offshore team to replicate them. Customers may be delighted today that they trimmed 30% on this, and 50% on that, but next year those costs are eradicated and they won't keep harking back to that successful outsourcing initiative they did back in '09. They'll be looking at what initiatives they can take advantage of next. Vendors need a proven delivery record and financial stability just to get to the table. 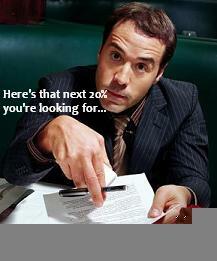 The vast majority of buyers now see these as table-stakes just to start a discussion. The Satyam fiasco has left some sore memories with customers, who do not want to experience a repeat of their vendor going belly-up, like Satyam almost did. Would you sign up with an electricity provider who might go out of business? The same applies to whomever is processing your business transactions and managing your IT. Moreover, with the industry for commodity work (i.e. technical support, application development, transactional accounting etc.) now quickly maturing, there's little room for companies without proven customer successes and experience within the customer's industry. Once at the table, customers are asking "what else can you give me?" Quite simply, there are several vendors today pushing services within a similar price-band and sufficient track record of successful delivery. Furthermore, most large enterprises have already experienced offshoring and outsourcing varying degrees of their operations for several years' now, and are smart enough to realize outsourcing provides an opportunity to deliver more than simply cost-savings (see Part I). Consequently, the ability to provide outcome-based pricing is now a critical component among a third of customers, and an important consideration for most of the rest. Innovation / transformation now becoming major decision-swayers. While on the surface, it may appear that transformation and innovation are only secondary considerations (i.e. not a "deal-breaker" for three-quarters of customers), when you take into account that most vendors are offering similar solutions at similar prices, it is these categories that are fast-becoming the decision-swayers. Brand not nearly as much of a consideration. I do view this skeptically, as people rarely admit they are swayed by brand, however, the fact that it is the least important selection criteria does tell you that service delivery these days is much more about the realities of delivery excellence, than the label they under which they are delivered. Engaging with a second-tier offshore brand is now seen as acceptable as a household Western brand. Moreover, executives these days can get fired for using a big brand and messing up. The sheer number of customers that have engaged the new breed of offshore service providers, in recent years, has significantly leveled the playing field when it comes to brand. The bottom-line: those that fail to invest in the future delivery model will likely get cast aside. To conclude, it's clear this business has reached a critical juncture where providers are being judged on their ability to go beyond standard services and deliver real business value for their clients. Decisions are made on which vendors have invested in creative staff with industry domain skills, backed up by the table-stakes of delivering bread-and-butter services at competitive prices. Everyone's talking a big game right now, and it may get them to the table... it may even win them new business, but their real challenge is whether they can truly move clients up the value chain and help them find new avenues for productivity and growth. While a lot of basic services contracts are being divvied out in this post-recessionary era, if today's winners fail to invest in upping the value of their service provision, they may find these clients seeking alternative service partners before long. Some vendors will always be happy delivering low-end services, however, if they see their business going to competitors with higher-value propositions, they will desperately seek out ways to remain competitive. The question is whether they have the appetite and culture to invest to find that next level of performance for their customers. Sign up for the HfS Research newsletter and get the best research delivered to your inbox weekly. Phil, Smart vendors as you suggest are investing heavily in building domain knowledge and functional expertise. By doing so they start to differentiate themselves from common stock outsourcing vendors. Also they are focusing more on building long term strategic partnership with their clients, strengthening areas where clients need more assistance. With partnership mode vendors are effectively moving up the value chain by contributing towards client objectives and providing them edge by leverage their competency centers and niche skills. This approach keeps the customers satisfied and also provide ample growth path for the outsourcing vendors. My views and predictions - Businesses are & were always judged based on ability to go beyond standard services and real business value but willingness to pay for this value is shrinking many fold, hence western countries will continue to find only cost arbitrage deals in current and newer markets for next few years without enhancing their overall business capabilities and hence reducing customer and employee satisfaction. New technology and delivery models which will be based on very enhanced process/business capability with 1/4th cost and 4 times customer and employee satisfaction will emerge and eat into 40% Revenue of current organizations. so my advice to organizations is to spend money on enhancing overall business capabilities rather then only focusing on bottom-line, as 2010 to 2011 is critical juncture for companies to be good to great or get wiped out by 2015.
would like to respond at two levels of dynamics. One at the definition of Core vs. Non Core (implying non core can be outsourced) and second at tactical level of what next after the benefits of Y1 have been accrued. The definition of the former has evolved considerably since the time outsourcing has come of age (and is still continuing). At the beginnning, it was transactional / data entry processes that were considered as non core and hence were being considered conducive to outsourcing. Today there has been tectonic shift in that thought process, the holy grail of the past is not that holy today, as business leads are challenging the definition of Core. We dont have to look far for an analogy, let's see the automobile sector, which i beleive has relatively a far higher degree of maturity to the services. There are instances wherein a majority of the components are outsourced (to ancilliary units) with a view of managing logistics and product costs. These ancilliary units act as aggregators and hence can provide cheaper goods at the desired quality, and if the inventory is JIT, it's a bonus. Keeping the above in perspective, the conventional outsourcing is following suit. There are higher benefits in outsourcing as we move a knotch up in the knowledge economy, say from data entry to formulating a procurement strategy for a category. 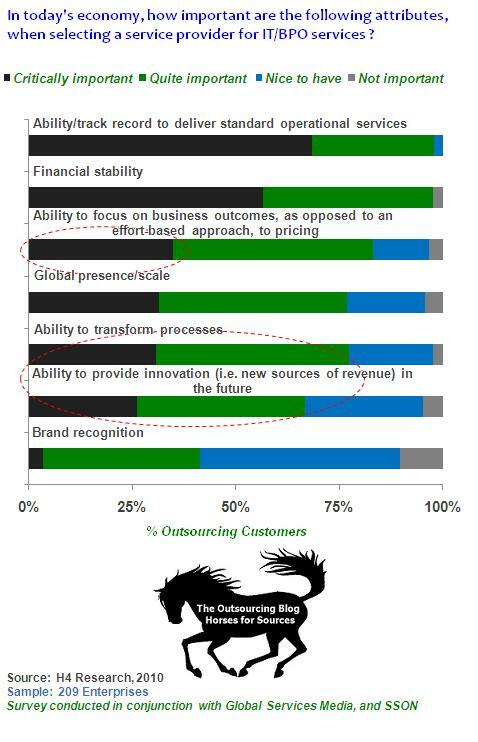 That's how we need to view the context of outsourcing. Now for the tactical piece of what next after Y1. I beleive any service provider needs to bring more on the table than just labour arbitrage to survive. It needs to have a sound strategy for technology intervention through pointed solutions in addition to domain expertise. So while you are in the process of outsourcing, the service provider also needs to understand and jointly define the "what next" in terms of process re-engineering and automation that can be implemented to drive transformation beyond the initial tactical element of labour arbitrage. To summarise, it's a flat world in terms of knowledge, the question is, to what extent does one have the courage to leverage it by chosing the right partner. Great piece. Funny how people are looking at the growth of outsourcing as "IT industry growth". Yes, it signifies the growth of offshore IT services, but a shrinking of actual IT employment onshore. Since its de rigeur to compare the Services outsourcing to the automobile wave from 70's or 80s, its perhaps worthwhile remembering that Toyota has built 10+ plants in the US over the last 30 years and they did close the last fiscal with 20+ Bn in Gross Profit. Effective use of resources available (call it lean or something else) does make a difference. Cheaper locations are not the only influencers. Investments are indeed the key to maintain competitive offerings. But that begs the question as to who has the money to invest. Facts suggest that the India-heritage company have a 20%+ net margin while some of the traditional leading service providers have a less than 10% margin. Most India heritage providers also seem to have significant cash on hand. Having cash on hand or available margins, does not necessarily always translate to making wise investments (Edsel?) but it does make investing easier. This is well dug Phil. Also, a point to note is regarding vendors who are not capable of investing to get the functional capabilities will not be anyways in a position to bid for certain of the services that are surveyed, but would indeed like to have those in future. Is it time for Western and Indian services cultures to blend? Blog Post: Why is UiPath obsessed with this "Funding Arms-Race" when it should be focused on scaling its clients? Join 24,000 other Horses in our LinkedIn community. Follow the Horses on Twitter. Scroll to see all of our categories!